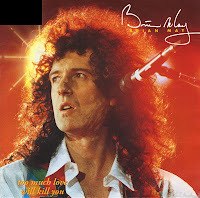 'Too much love will kill you' was written by Queen guitarist Brian May, Frank Musker and Elizabeth Lamers. The lyric is about May's feelings during his divorce, and the choice one must make between two women that one loves equally. The song was recorded around 1988 or before, and was intended to be on Queen's album 'The Miracle' in 1989. In 1992, Brian May performed it at the Freddie Mercury Tribute Concert after the death of Mercury in late 1991. It also was on his solo album 'Back to the light' that same year and released as a single, charting in the top 10 in the UK at number 5 and reaching number 1 in the Dutch Top 40. Unheard by most Queen fans with Freddie Mercury on vocals, 'Too much love will kill you' appeared on the 1995 Queen album 'Made in heaven', released four years after Mercury's death.